I went to the local Post Office on an errand for Monissaw and saw that the supermarket--which contains the PO--has restored the charity book table that disappeared during the Christmas period. And for a while afterwards. Hurrah! The Complete Idiot's Guide to Boating and Sailing by Frank Sargeant. See? It's even got my name on the cover ;)! These trips to the local town are going to be the death of me, physically or financially. Or both. The Time Traveller's Almanac, edited by Ann and Jeff Vandermeer. I also bought a book about the West Riding for my dad, and another book as a present for some other peoples. Busy day. This is a nice little book (esp. for $10). 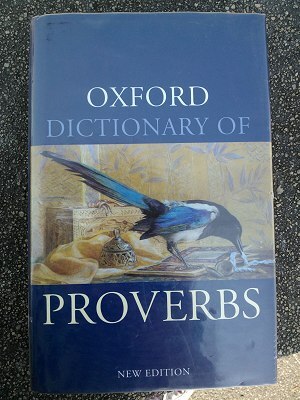 It has the origins/examples of early uses for each proverb (like the OED does for words). Shall see lots of use, I'm sure.